Sean Scully is one of the leading abstract painters working today. His work is represented in most major international museums and has been the subject of an extraordinary number of retrospectives around the world, in Europe, the Americas and Australia. Born in Dublin he divides his time between New York, Barcelona and Munich. Scully occupies a special place in the contemporary art scene, and is widely credited with having expanded the possibilities of abstract painting after minimalism. His abstract compositions, made up of horizontal and vertical bands painted with broad brushstrokes are unique in the context of international contemporary art. He continues to use a restricted visual language with unique and astonishing virtuosity. This book has two purposes. It accompanies the exhibition Works from the 80s by Sean Scully and more importantly, it provides a survey of his painting from this particular period. In the early 1980s, after the minimalism of the previous years Scully re-introduced colour, space and texture through the application of multiple layers of paint and thereby added an expressive element to his work. 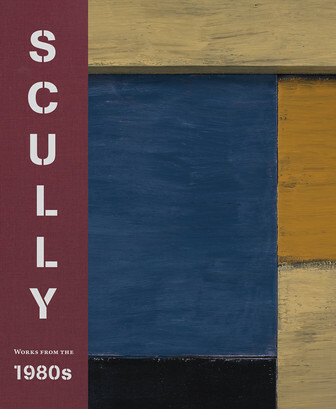 By the mid 1980s Scully had gained international recognition and many major museums began to acquire his paintings. His work was included in the Museum of Modern Arts 1984 exhibition ‚An International Survey of Recent Painting and Sculpture‘. The following year the Carnegie Institute in Pittsburgh organised the first major exhibition of his work in America which travelled to Boston. Four years later his work was the subject of a major solo show in Europe that originated at the Whitechapel Gallery in London and toured to Madrid and Munich. With contributions by Tanja Pirsig-Marshall, Arthur C. Danto and Armin Zweite. Scully’s work is very much connected with the real world. As he has said ‘it is physicality in art that keeps it connected, affirms its connection and its dependence on the real world, on life, on ordinary life’.